Synonymous with unparalleled innovation, quality and resilience, Volt Loudspeakers can be heard in some of the planet’s most prestigious recording studios and venues. Abbey Road, BBC’s Maida Vale and The Royal Opera House to name a few. Consequently, Volt loudspeakers have been used in the recording of countless albums and soundtracks that have shaped the face of popular music today; Stevie Wonder, Prince, Kraftwerk, Coldplay to name a few. Since it’s foundation in 1978, Volt’s philosophy has remained simple: ‘Music is a universal language and we believe that it should be translated from musician to listener as honestly as possible. Therefore, the performance and quality of all our products must be state of the art.’ In order to achieve this Volt have set themselves apart from other manufacturers through their commitment to innovative product design. Cone loudspeakers are in fact very inefficient, with even the best transducers only converting around 5% of the electrical energy supplied into sound, the majority of the remainder is converted into heat. This wouldn’t be a concern, except for the fact that most voice coils are made from copper or aluminium, both of which have a positive temperature co-efficient of around 0.4% per °C. What’s the significance of that? I’m sure you will have heard of superconductors, which operate at extremely low temperatures in order to try to reduce and minimise resistance. Loudspeaker voice coils unfortunately work in the opposite direction: as the temperature increases, the resistance increases. 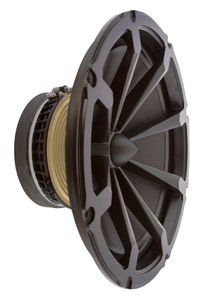 Over the years loudspeaker coil technology has advanced, and a modern state of the art voice coil is designed to withstand extremely high temperatures operating at up to 3000C when driven hard. A temperature coefficient of 0.4% may sound insignificant, but at only 2300C the voice coil resistance has almost doubled which causes the voice coil impedance to increase accordingly. Some simple maths and you can quickly see that the increase in temperature can make your 8 ohm speaker behave like a 16 ohm speaker, which will cause your driver to be operating at significantly lower power than you might have thought, contributing to what is known as Power Compression. Power compression is the little bugbear that can upset your best laid plans, and give you reason to throw the manufacturer’s specifications out the window. Power Compression results in a loss of sound output, and heat in the voice coil plays a major part in power compression, so reducing this heat is a key factor in reducing power compression. Many manufacturers choose to ignore power compression, some actively avoid specifying it or even mentioning it. 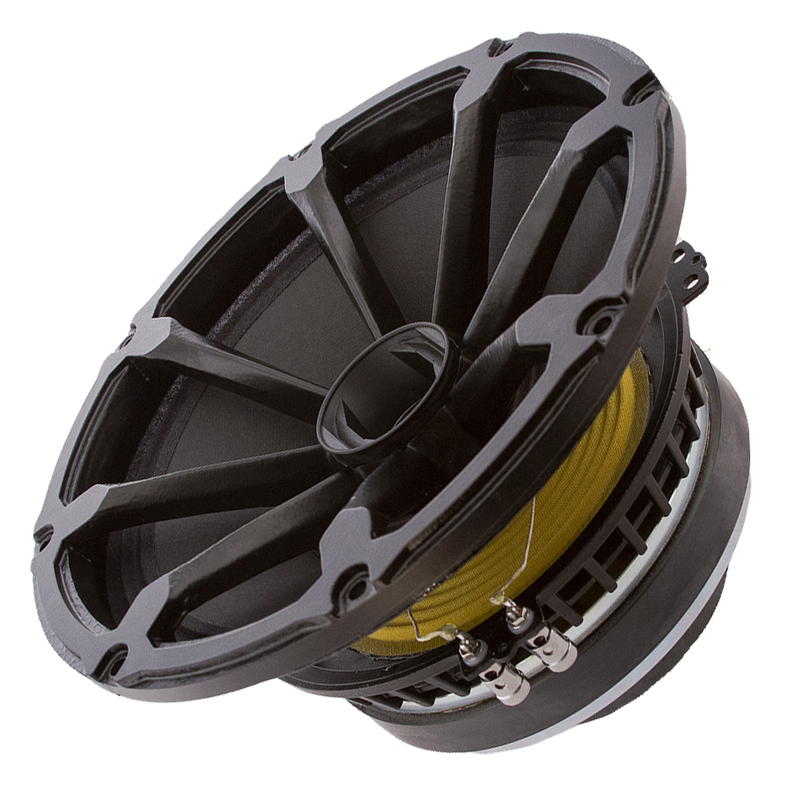 Volt have taken the opposite approach; actively tackling power compression, resulting in a key feature of Volt Loudspeaker design: Radial Technology – a cooling concept based around a unique chassis design that allows exceptional power handling and reliability. It’s not by chance that David stumbled across this, now patented, design idea. He conducted experiments to reduce voice coil temperature by ducting the heat out of the driver and cabinet into cool air using a heatsink. This led to the eureka moment of of using a front mounted chassis as the heatsink thus killing two birds with one stone! 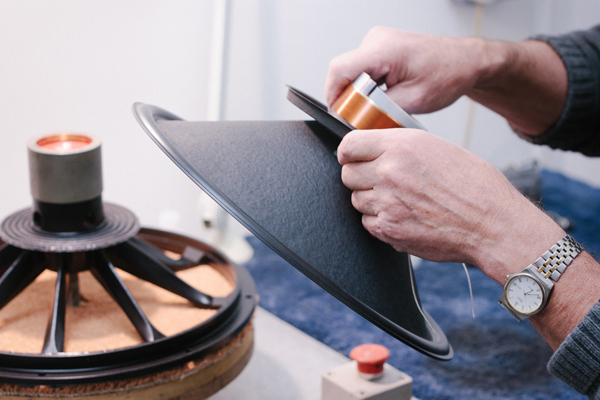 Whilst many conventional loudspeakers may appear to have a similar specification on paper, their performance can deteriorate dramatically after just a couple hours of use due to the detrimental heating of the voice coil. Power compression will cause the volume to drop, and if you have sufficient voltage headroom in your amplifier system, you may be tempted to turn your amps up, whilst this may initially give you a slight increase in volume, ultimately it will just cause more heat to be produced, and even more power compression – ultimately leading to driver failure. Power Compression can also have a very noticeable negative effect on sound quality, common symptons being suppression of the mid output and misaligned bass enclosure tuning, resulting in boomy bass and muffled mids. Whilst he’s reluctant to admit it, David has over has over 40 years experience in the industry. 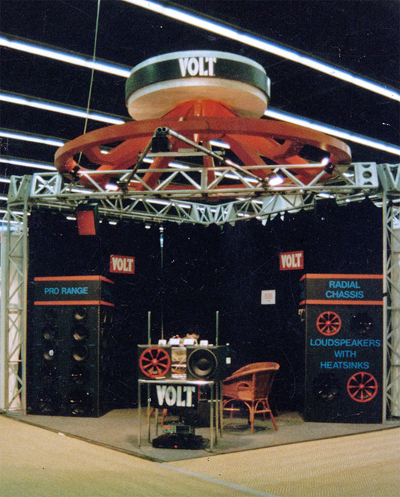 Prior to starting Volt, David worked for Gale Electronics, Martin Audio and Sanyo. Volt’s first premises were also in London’s old EMI buildings – so it grew within the finest traditions of the British audio industry. Now based in a rural location in Dorset, Volt Loudspeakers are moving into an exciting new era. 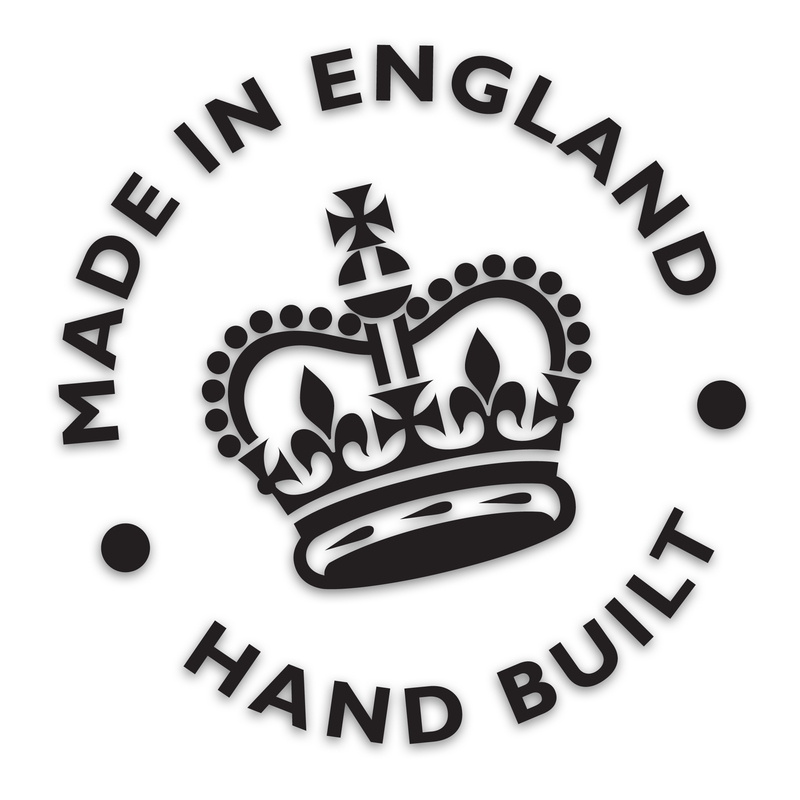 With a ‘no compromise’ attitude on quality, all Volt Loudspeakers are hand built in the UK using precision manufactured components. In 2013, David relinquished control of the management of the business and handed it down to his daughter Cat, creating an opportunity for the next generation of British speaker building to grow and flourish. Unsurprisingly Cat has grown up against a backdrop of loud music, she attended her first industry trade show with her Father aged just 6 months! In later years, she has worked at Volt in various roles from production, administration and on exhibition stands. Consequently, Cat appreciates the importance of continuing to hand build all of Volt’s speakers and inductors. She knows that Volt’s meticulous approach to sourcing materials and using leading technologies is fundamental in offering the superior sound performance and high reliability that the company is so respected for. Working alongside Cat is her fiance Steve, who is from an audiovisual and electronics background with over ten years experience in building and installing sound systems in a wide range of locations spanning clubs, festivals and corporate environments. A technically minded chap, Steve is now working under David’s wing to ensure the smooth running of speaker and inductor production at Volt and will be working closely with David to develop and launch new products and refine production systems. Blue Aran will be taking stock of demo units in the coming months, so if you want to compare your existing loudspeakers to some Volt Loudspeakers, get in touch and we’ll arrange a testing session for you to pop down and see us. 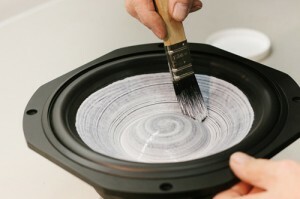 Originally set up as a supplier of components to Turbosound, PD now has its own fine reputation to uphold, making transducers for countless touring companies worldwide. With manufacturing facilities at their base in Yorkshire, their product range includes drivers such as the PD.1850, PD.186, PD.1851 and PD.1852, which by many are considered to be benchmarks for the highest quality loudspeakers on the market. Precision Devices offer a full confidential bespoke service, providing custom-manufactured models to manufacturers such as Funktion-One. 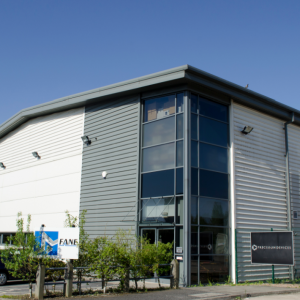 Blue Aran is proud to have supported Precision Devices since it was acquired by the Barnes family after it left the Harman Group. We have seen the company grow, and demand for high quality drivers increase over this time, and we remain one of the few UK dealers who hold significant stock of Precision Devices transducers, enabling us to deliver next day throughout the UK. If you’re considering using PD drivers on your next project, contact us for a personalised quotation.